Drive through Downtown Los Angeles and you'll be hard pressed not to spy the steel behemoth that is Disney Hall. It was just a mess of scaffolding and raw materials when I was in college a decade ago, but now it is easily one of L.A.'s most recognizable cultural landmarks. While I've passed by it numerous times and parked in its parking lot for all sorts of things, jury duty being the least appealing of such visits, I have only had the pleasure of taking in a couple concerts in the world renown music hall. Last Sunday my husband and I went to hear a concert performed by the California Philharmonic. The concert, "Cowboys and Copland", wasn't my pick, but it was right up my classical music and filmscore-loving husband's alley. 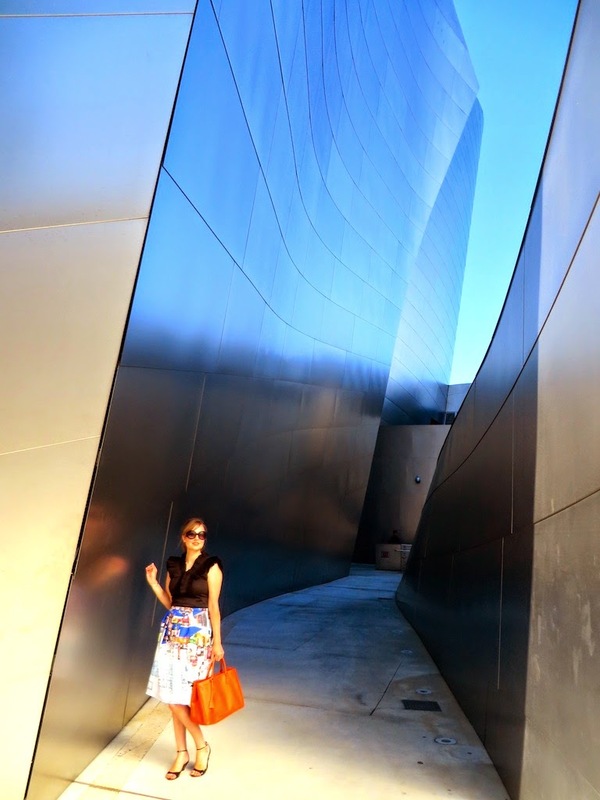 Checking out the architecture and the nooks and crannies of the Frank Gehry designed Disney Hall was my cup of tea, however, so I hope you will enjoy this very picture heavy post of me enjoying the scenery and architecture of Disney Hall. The skirt I am wearing is from Clover Canyon. I thought it would be appropriate to wear because it is all about design and architecture. The quirky print details the blueprints of a home and a birds-eye view of what I assume to be the end results of the blue-print. I first discovered this amazing skirt on phiphi's blog and I knew it had to have it. Thanks to some expert sizing advice from the lovely phiphi, it arrived at my doorstep shortly after first discovering it on her blog and it fit just right! 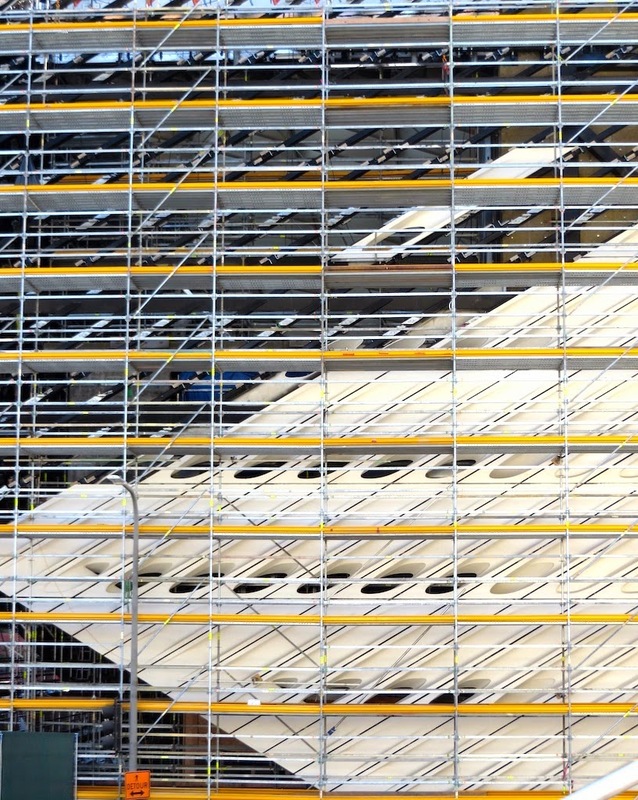 Pictured below is the skeleton of the upcoming Broad Museum, which is situated right next to Disney Hall and scheduled to open in 2015. Eli Broad is a power player in the world of contemporary art and has enough money to build his own museum to house his own collection of art. What a great way to secure one's immortality! 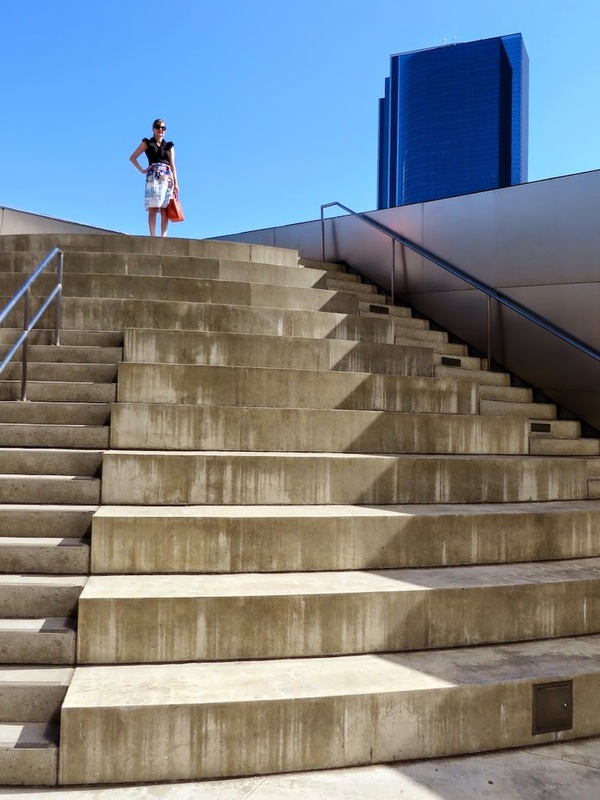 If you have the time you can visit the rooftop portion of Disney Hall. It features gardens, sculptures and more curvy metal stuff that architect Gehry is so well known for. I really wanted to venture here after seeing the movie Her, which had a short segment filmed in this location probably due to the film's futuristic setting. The rose sculpture I am standing in front of is dedicated to Walt Disney's wife, Lillian Disney. The mosaic is constructed out of broken shards of Royal Delft porcelain vases which were her favorite. Well, I hope you enjoyed my adventure to Disney Hall. From the bottom to the top it is a cool place to hang out, hear music, and take blog photos of yourself. I hope to return sometime soon! Katie you are simply stunning here! Such a lovely photo set! Thank you Laura! Disney Hall is such a fun place to walk around and take pictures. I can understand why they film so many movies/commercials using the exterior of the building. I love the Diney hall for photo shoots, I have done a couple of stories there. 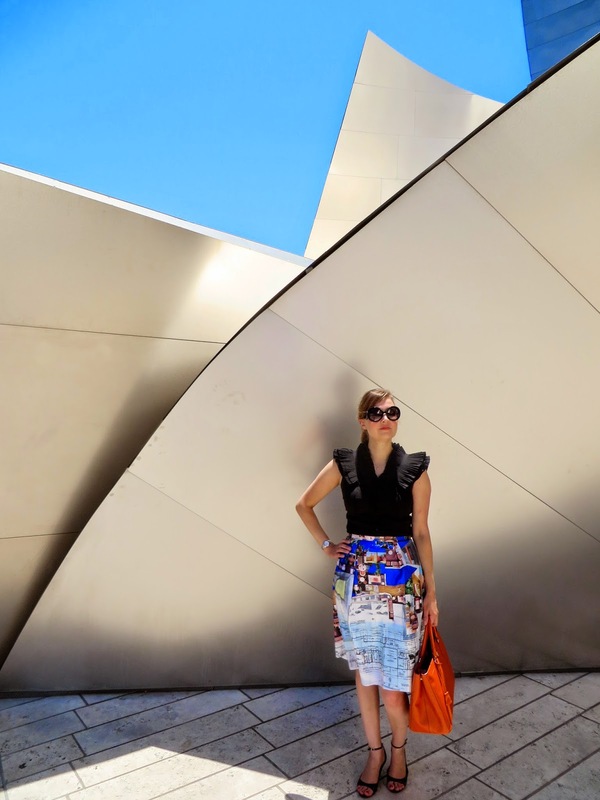 Such a fun skirt and I love your bag! Thanks Nora! 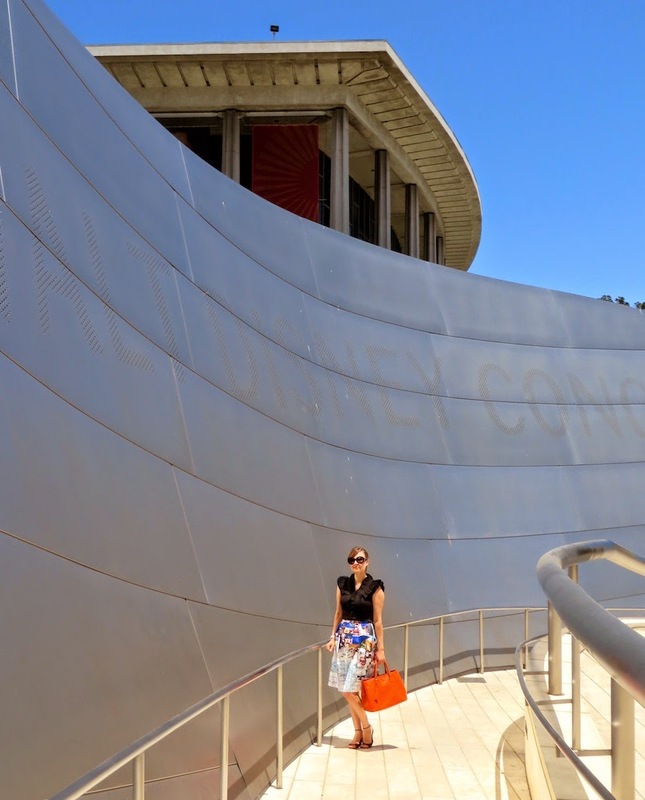 Yes, Disney Hall is the perfect place for photo shoots and of course to hear music. I'll have to check out the stories on your blog! That top is amazing! It looks perfect with that fun skirt! Thanks! This top is actually really "old" and I just rediscovered it. I think I will be wearing it more in the future as it's a nice basic with a little something different! amazing pictures, and lovely skirt! Thank you Marie! 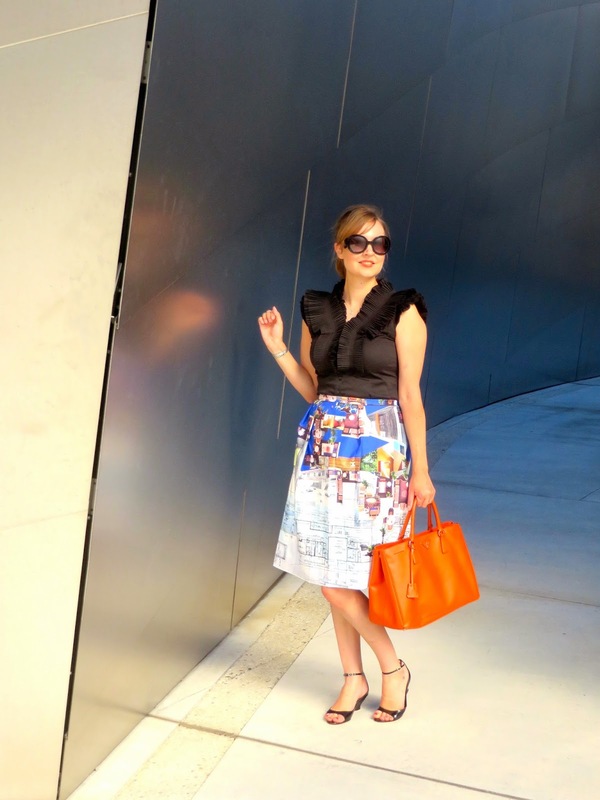 Disney Hall is such a fun and picturesque place to use as a backdrop! This is such an amazing skirt! I just love the rendering details! Great find! Thanks Monique! The details are my favorite part of the skirt too. I could probably look at it for hours and spot new things! Thank you Sarah! I wasn't sure what top to pair with the skirt, but I figured the ruffles would be something a little different. Thanks for stopping by! Really cool pictures, I love all of the style and architecture in your backgrounds. The skirt is like a piece of art itsself, beautiful. I love the black ruffled canvas that you chose in order to show off the detailed skirt, And your bag.. I am a collector, Love it! Thanks Jessica! Yes, I love the idea of a piece of clothing as art. Thanks for stopping by to check out my blog from the link up! Thanks phiphi! I really appreciate your help and advice with the sizing. I am new to Clover Canyon and it's always tricky figuring out a new brand.